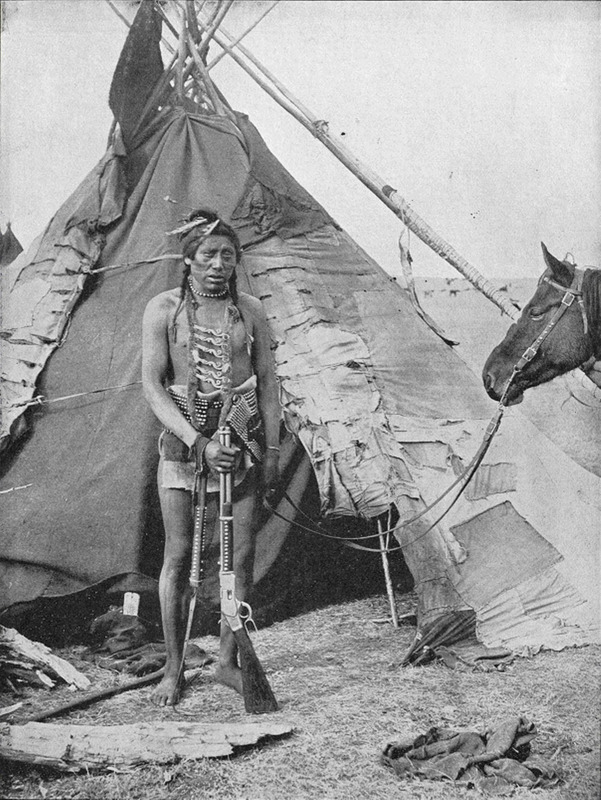 This photograph of a Native American man standing next to his teepee was taken around 1890, somewhere in the Indian Territory. The Indian Territory was land set aside by the American government as a place to deport American Indian tribes and restrict them to what was meant to be a new homeland for them. However population expansion by American settlers resulted in more and more of the Indian lands being taken from them and absorbed into what is now Oklahoma. The man in this picture is barefoot and dressed in traditional native dress. He is holding a rifle and the reins of his horse. Behind him is a traditional teepee made of animal hides and wooden poles. There is an opening in the ceiling for ventilation and to allow a fire to be lit inside the tent. The teepee was the ideal home for a nomadic people as it could be set up and disassembled quickly.